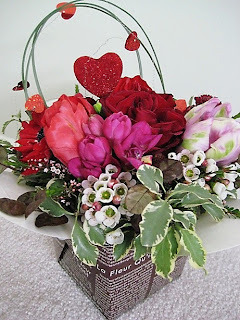 Label Tulip Blog: Happy V-Day!! I arranged this for valentine and I am in love with it! Hope you and yours have a great Valentine's Day! PS: CHA photos will be posted soon! 3:30AM planning for our future kits and placed MANY orders!! Can't wait to see boxes of new products and share with you! Your arrangement is absolutely stunning! Maybe you should be considering a side job??? Your talent is obvious!! I just found your site and I can't wait to see what goodies you picked out at CHA! A belated Happy V-Day to you too! I can't think of anything more fun than that, lucky girls!!! dying t see the kits! can't wait to see the CHA pics! what a beautiful flower arrangement! CHA sounds like more fun than X-mas. It must be so fun to open all the boxes and handle all of the new product. Can't wait to see what you have come up with!